Yesterday began in near-distance flurries and ended in gale-force winds up close and personal. There were flurries then, too, a veil of small falling flakes like a shower of diamonds in the light of the setting sun. Today has dawned bright, sunny, and still, the world frozen to a crisp in a surface rime of ice. And the winter storm hovers just off to the southwestern horizon, a bank of heavy violet clouds moving slowly but surely this way. According to the forecast, there will be heavy weather before the day is done. But for this early-morning moment, it’s no more than a hint, close nor real enough to consider a promise — like the distant, haunting call of the new spring birds, nothing more than a whistle on the wind. The birds, though, will know before we do, should real weather actually materialize from it. So will the other wildlife: the early butterflies; coyote, ever present; late elk not yet returned to high-mountain safety. They possess still-sharpened senses in ways that we do not, and perhaps some that are — now, at least — wholly denied to us. Modern conveniences have made our lives far easier, but they have come a cost, and should we be plunged into the natural world and need to survive, we would find our instinctive skills gone to rust. If you spend much time out in this world, ours, the one of earth and sky, of wind and storm, of wildlife and plant spirits (and other spirits less easily named), you learn just how complex, how adaptive and advanced, its immanent function truly is. You come to realize that this world communicates with itself, with its constituent parts, its peers and its offspring, in ways not merely denied to us now but of which most humans are wholly unaware. It’s communication that crosses species lines and other categories, too, ways of listening, hearing, understanding, knowing that go beyond our rudimentary human concepts of speech and language. Despite what we consider here a “good” winter — that is, one sufficiently cold, and with a certain minimum level of snow — changes still abound, and visibly so. Down the Gorge, a road we traveled nearly weekly the first three months of this year, there were no eagles visible, despite it being a traditional landing site during the cold season for migratory balds. Part of that is no doubt due to the habitat disruption, for most of last year, that relocating a buried pipeline entailed; our concern now is that the disruption might turn out to be sufficiently severe to make their winter absence permanent. Up here where we live, there was another noticeable void in the winter just past: no elk came down the mountain to visit. In most years, once winter reaches a certain depth, of both coldness and lack of forage, the mountain herd makes its way down to our level. They spurn human contact, mostly avoiding it outright, but the one place they have always felt safe is here on our own bit of local earth that we share with other resident wildlife. They sometimes come no closer than the south fence; other years, they find a gap and make their way into carport, hay barn, the trees right around our own living quarters. Perhaps there have been other risks that have kept them from their usual winter patterns: a warming earth, multiple avalanches, increased human habitation at the lower elevations. They make easy targets in the cold season, and in this colonized space, there are always poachers willing to risk their own liberty for the sake of a trophy rack of antlers. The elk know all this, and they communicate accordingly. The Indigenous people of this place long ago learned this language, in a manner of speaking — or, to be precisely accurate, not speech at all, but calling and . . . whistling? Yes, whistling. If you have no idea what I’m talking about, Google the phrase “elk whistle,” and you’ll learn that not all of their calls are of the bugling variety. 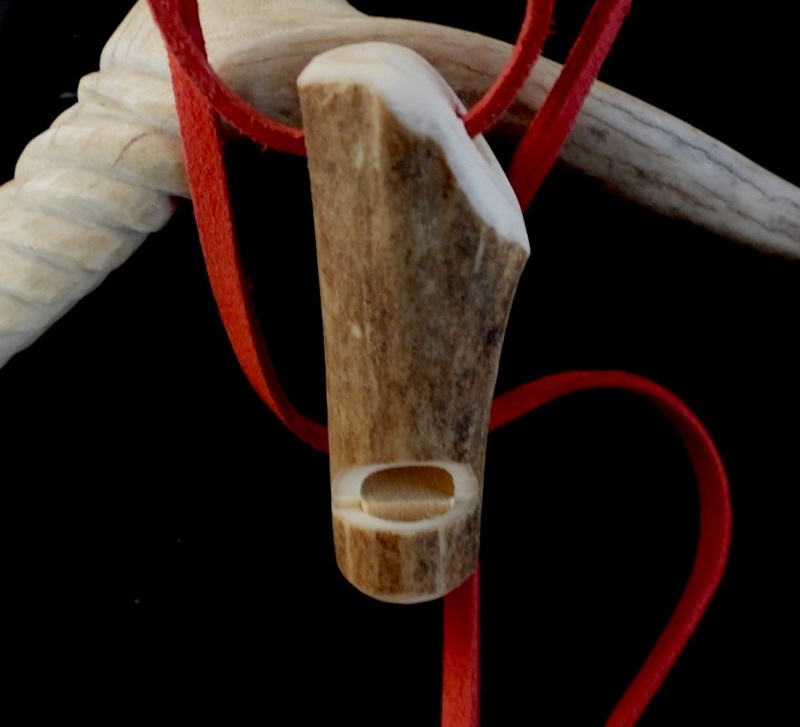 Sharpen your traditional hunting skills or simply learn to communicate with the herd with this hand-made elk whistle. 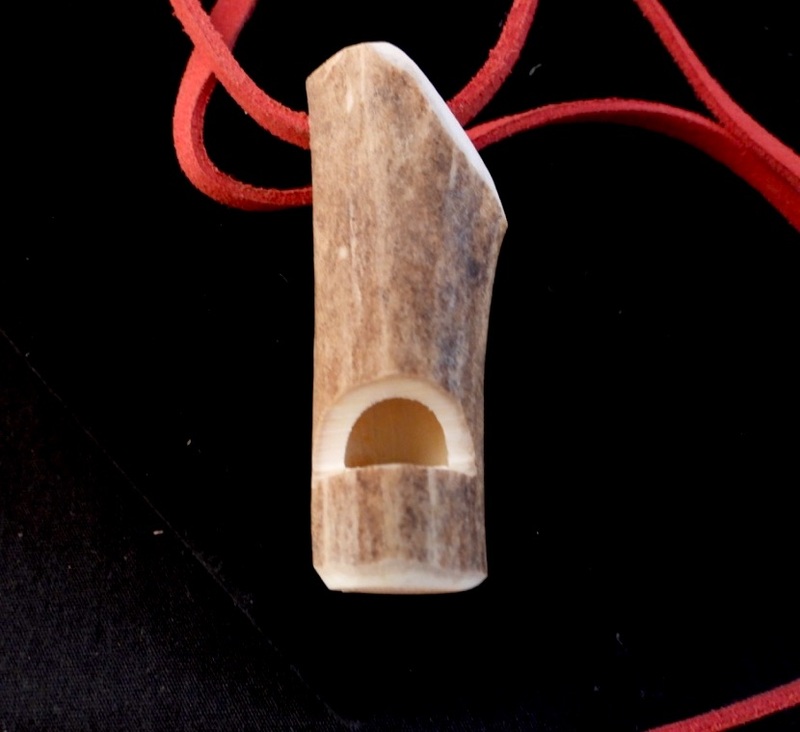 Carved of deer antler entirely by hand by Joseph “Joe T” Trujillo (Taos Pueblo), this vintage-style whistle is fully functional for use in the back country. The deer antler is treated with a clear stain to seal it against the elements; a hole hand-drilled through the top holds a long thong made of bright, highly-visible red leather. 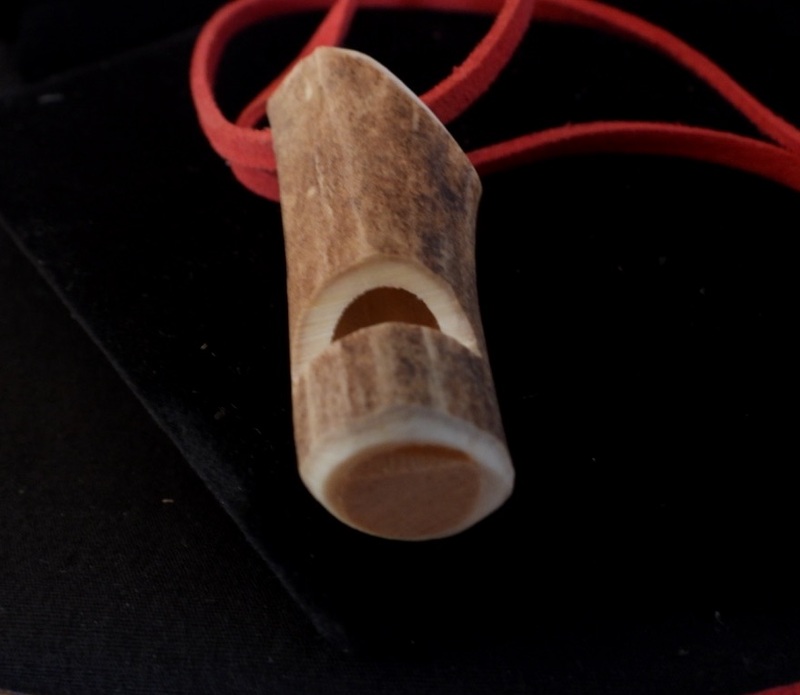 The whistle stands 2-1/8″ high at the highest point by 3/4″ across at the widest point; thong is 26″ long, excluding knot (dimensions approximate). Other views shown above and below. The maker of this whistle, like Wings himself, knows these old ways well. They both came of age in a time when such traditional practices were not merely what the colonial culture likes to label a rite of passage, one still observed only ritually amid modern conveniences, but an integral part of everyday life. Today, such pieces, vintage-style or no, are regarded by the outside world as art, or perhaps more accurately with regard to that world’s perception, as artifacts. But our peoples know differently. Do you know the language of the elk? Could you, under the press of circumstance, communicate with the herd? Do you recognize that sound of a whistle on the wind? If not, perhaps it’s time to learn. All content, including photos and text, are copyright Wings and Aji, 2019; all rights reserved. Nothing herein may used or reproduced in any form without the express written permission of the owner. Posted on Friday, April 12th, 2019 at 8:32 am. Filed under: The NDN Silver Blog Tags: The NDN Silver Blog	RSS 2.0 feed.